Shopping for Hot Wheels Playsets? Now kids can create their own unique customized cars! 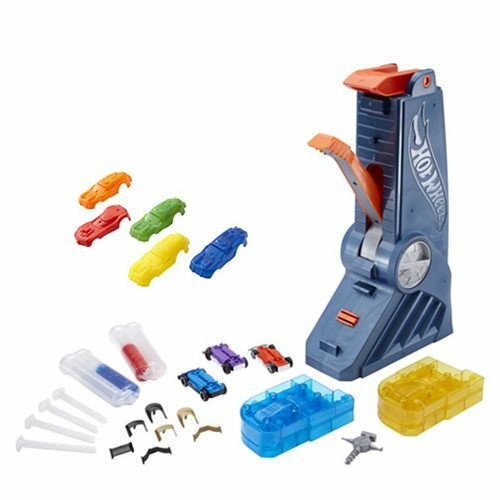 Use the Hot Wheels Fusion Factory Car Maker Playset to create custom silicone vehicle bodies. Then add a chassis and accessories, and they're ready to race! The Fusion Factory puts kids in the driver's seat of vehicle design with tons of options. They can make up to 4 epic Hot Wheels cars right out of the box. And these cars are not just for show - they can hit loops, ramps, and stunts with true Hot Wheels performance! The playset is safe and easy to use. Choose your car mold and insert it into the top of the factory. Select one of the 2 included color syringes, and insert your selection and the mixing stick into the machine. Pull the lever down to start mixing the materials. Set the included timer, and wait for the silicone to cure. Next, remove the body from the mold and attach one of the 4 included chassis. Then it's time to get really detailed. Customize your car with awesome accessories and you're ready to race a new speed machine!